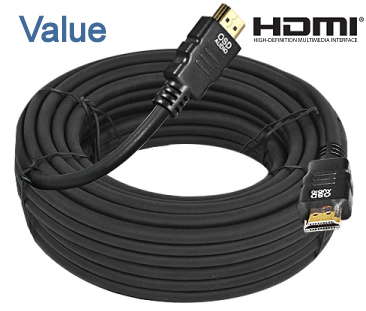 Extremely flexible and easy to run through walls and around corner, this durable 100-foot long HDMI® cable combines video and audio into a single digital interface. HDMI cable labeled “High Speed with Ethernet" meets the minimum 10.2 gigabit transmission rates. The shorter the cable the higher the rate but 10.2 gigabits is currently the minimum that is needed to be labeled High Speed with Ethernet. OSD HDMI® cables transmit frequencies up to 10GHZ bps and transmit high quality multi-channel audio data. 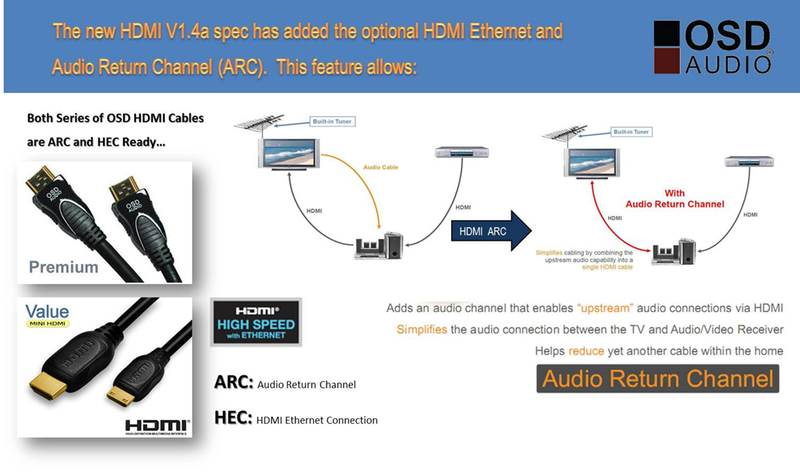 Our HDMI® cables support all standard and high-definition consumer electronics video formats including 1440p and 3D. Note: Runs over 40 feet may require an HDMI® extender. Along with this cable do I need to buy another cable for audio (from either projector to Amplifier/mixture?) I have View Sonic projector. I have sound room. Where in Brea are you? 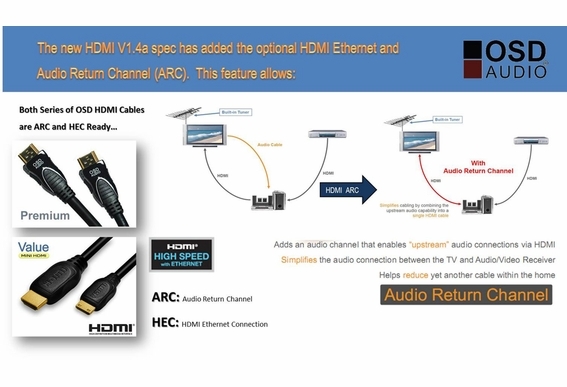 HDMI will transmit audio and video if both components have HDMI inputs/outputs. RCA will transmit audio only. We are at the address below: 775 Columbia St. Brea, CA 92821 Columbia St. is between Lambert and Central off Berry. I am installing two screens for projection in a church. The shortest way between the video boot (where computers and hub will be locaed) and the screens is about 200 ft. What is the best solution you suggest? HDMI or Ethernet? Color may also be an issue do you have any white cable? I purchase 2 of these items for a commercial installation (Sports Bar). a few months ago. One of the Flat screen HD T.V. 's is currently turning off and on at random intermittently. 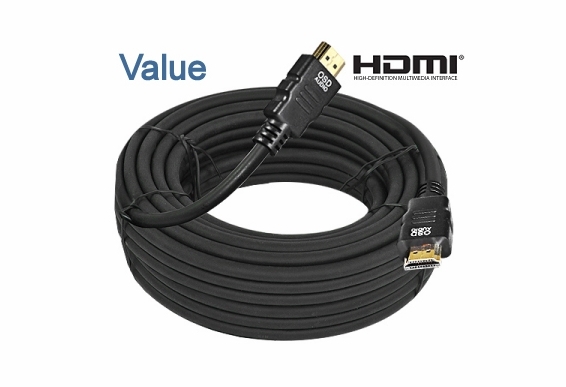 What is the gauge of your OSD-HDMI-100ft-Value-V14? Is the V14 certified? Do you ever have "out of box" failures of HDMI cables? Since I've had this problem, I've talked to other people in the industry and they recommend not to do HDMI 100 ft. lengths and to install Cat. 6 with HDMI Extenders. What is your opinion? MY HP PAVILLION A 1710 N COMPUTER HAS A ETHERNET 10/ 100BT CONNECTOR. WOULD THIS CORD WORK TO CONNECT TO THE HDMI ON MY T.V. PLEASE ADVISE. THANK YOU. Have you had any customers successfull use this in an underground application? Hi Brian, This HDMI cable is CL-3 rated which is an in-wall fire rating. We do recommend our CL-3 rated speaker cable for direct burial but that jacket is both CL-3 rated and thicker by design. I am not sure if this would be advisable to bury and I’m not sure if a 100-foot HDMI would work as well in this application. The longer the HDMI cable, the higher the chance is that it may not work. You might consider our HDMI single Cat5/Cat6 extender system that features a transmitter and receiver. You still need to connect an HDMI cable from the source to the transmitter and a second HDMI cable from the receiver to the monitor. However, these would be shorter HDMI cables guaranteed to handle the bandwidth. The longest cable would be Cat5e which is available in a Direct Burial version. The transmitter not only processes the signal over the Cat5e but boosts it as well. The receiver reprocesses the signal back to HDMI. You can find Cat5e (which is better than standard Cat5 and similar to Cat6) direct burial cable for .22 cents per foot on line. Whatever option you choose you need to connect all components with the actual length of cables and test the system before burying anything.